Lizzie found this painfully honest listing. At least I hope it's honest. Because if they're writing "what is nestled next to a grave yard, a rundown eye sore and pink all over?" in a listing and that isn't honesty -- if they're actually hiding, you know, the bad qualities while including several photos of the graves right over the fence -- than just what could be in that basement? Radon? A burst sewer pipe? Bigfoot? It's the John Waters special -- only in Baltimore! It's straight out of The Wire television series is what it is. You can just picture the poor little corner boys camping out in the abandoned house in their white T-shirts and hoodies. Sounds like the listing agent was doing that laugh-or-you'll-cry thing - and basically said "Aw, eff it, let's go all out on this one!" "She is pink and she is a beauty. Priceless." I would keep the house pink. Afterall, everyone knows that zombies really dislike pink. Damn living in the burnt out slums of Baltimore make the graves probably the nicest possible thing to live near. If some trees would grow, all the better. Asking 100K is still out of line. People still dont get how inflated home values have been. I like all of the closeups of the things most likely to come loose and fall atop prospective buyers. Closeup of ramshackle chimney, focus on window about to fall directly out of its frame, etc. As if to say, "If you go anywhere near any of these, we're off the hook legally because...jeez, lemmings have better survival instincts." It's also covered in asbestos shingles. Anybody who demolishes it will pay a fortune for asbestos abatement. Whoever bought this last wanted to put up a duplex and ran out of cash. Hampden, the heart and soul of Batlimore! I don't think the Realtor really wants to sell it...i cant figure out why...do you think the Realtor is a pink loving goth who secretly hopes to buy this someday? It's almost too good to be true! It seems like it was written by a fan of the site just trying to be featured!! Ah, it's in Hampden, that explains everything. At $100,000, even in that condition, it will probably sell quickly. This is why I left Baltimore. Fans of the Wire or frightening neighborhoods will be excited to hear that Google Maps now has "street level" views of almost all of Baltimore. You can now sit safely in front of your computer and tour rows and rows of condemned buildings, some with the blue sky visible through the upper windows. I imagine that it's only bad around one time of the year, when all of the neighbors get up and welcome Jack Skellington back to Halloweentown. They lied!!! It is not pink ALL over -- there's some white areas in there. Well, shoot. Now I'm not interested in buying it. Wow. I drove past this house a few weeks ago when I was apartment hunting and saw the "for sale" sign. Really funny that I see it here too! Talk about a missed opportunity! I hope it's close to the fire department, because as soon as they fire up that chimney that house is going up in a blaze! Ah, Baltimore! City of Lights! City of landfills! City of crack houses! 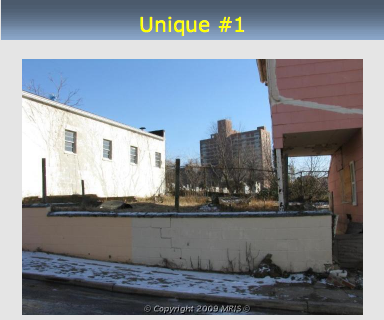 City that might as well be entirely Section 8! Well, at least they'll have well-behaved, quiet neighbors, whoever buys it..